Deliver private cloud solutions for accelerated investment in platforms, application modernization, ready to create cloud-native apps and data and analytics. Many organizations are adopting private clouds to attain the benefits of cloud inside the company’s firewall, while preserving existing investments. Private cloud is both a starting point for enterprise adoption of cloud, and the foundation for long-term progression of a fully hybrid and multi-cloud management system. But where do you start, and how to get from here to there? 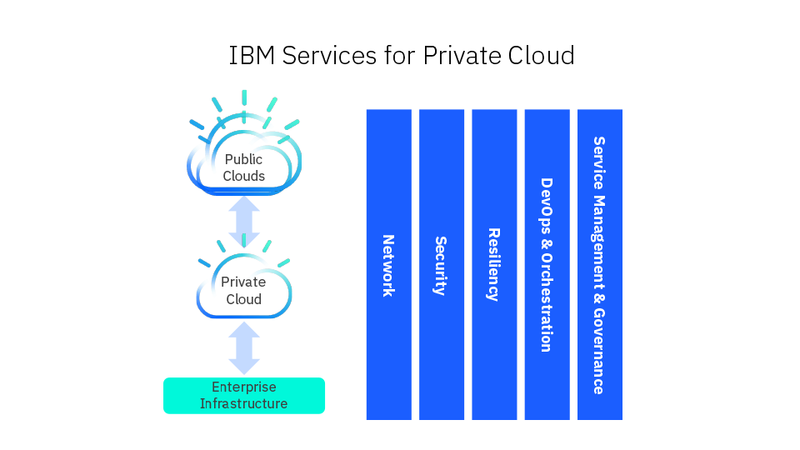 IBM Services for Private Cloud helps manage your transformation to cloud computing, from strategy and design to fully managed, highly available production workloads and data. Private Cloud is the first step to the cornerstone of a hybrid cloud management system. IBM expertise helps accelerate and ensure success of your company’s private cloud transformation.